On January 20th 1916 Private Harry Robinson of the 10th battalion sent a letter home to Gleichen which was published in the Gleichen Call. He says the trenches are in bad shape and filling with water to the knees and is starting to freeze up. He goes on to say that they are firing more shells in a day than during the whole of the Boer war. Another article on the same day says that Private J. Gittins and the 50th Battalion are currently in Bramshott England. Also Private T. Osler is back home for a month of leave after having been injured by artillery and having had 7 pieces of shrapnel removed from his groin. A article from the Gleichen Call dated December 7th, 1916 says the 211th Battalion left on December 2nd for Europe. The 211th was drawn from volunteers in the Gleichen area, though some of the men came from as far away as Calgary to enlist. Mayor Farquhason and Rev. Major Kirby both gave speeches and the community put on a dance and a dinner for the men. A January 4th, 1917 article lists the men from Gleichen and area who have volunteered to fight and have left for Europe. Some with the 211th and others from units previously sent over. Of those 2 had already been killed in action; J. Weddell of the 12th mounted rifles and Mark Noddle of the 175th battalion. On January 6th a Sgt. Jack Roberts visited Gleichen and when he left nine more men had enlisted. Also in the January 6th paper the list of men in various units from Gleichen was reprinted with those missed from the article on the 4th added in. There was additional fatality listed: L.J. Engstron of the 12th mounted rifles. There is a 1914-1918 circa picture of Walter James of Gleichen in his uniform, he served with the 113th Battalion called the Lethbridge Highlanders. Walter survived WW1 and came home on the S.S. Carmania in may of 1919. 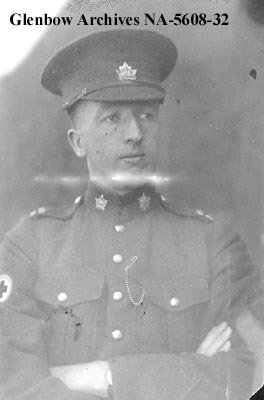 There is a picture of Tom Bates of Gleichen taken during WW1 that shows him in his Ambulance Corps uniform. There is another picture of him taken with his mother at the 1916 Calgary Exhibition. 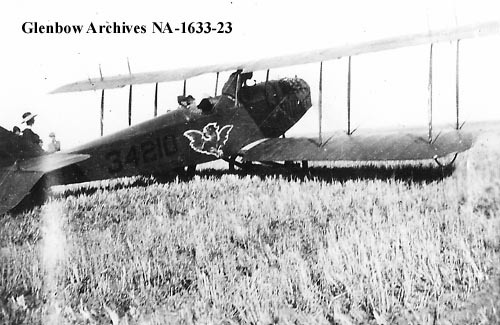 The first airplane to land in Gleichen was piloted by a Captain Fred McCall and landed outside of town in 1919 on his way to the Calgary exhibition. On July 5th he crashed on takeoff at the exhibition injuring himself and his two passengers when his engine failed on takeoff and he crashed into the merry-go-round. He was a decorated war ace with 35 confirmed kills in world war 1, he was the 8th ranked ace of the Canadian airmen. He founded a air freight company and later re-enlisted to fight in WW2. McCall way in Calgary is named after him. The following 32 individuals are listed on the Great War Project Website as having been from Gleichen when they enlisted in WW1. The website is adding more records all the time so these are all they currently have on the site. The January 4th article listed above was done at the time and lists the men who had left. Private Harry Barnes – 10th Battalion; he was wounded in June 1917 and died from his wounds on November 2nd, 1917. He is buried in Belgium. Private Conrad Befus – 31st Battalion – wounded at Passchendaele, August 1917. Records show he came from Calgary to Gleichen to enlist. Private Lawrence Brown – 211 Battalion. Private William Henry Busby – 211 Battalion; was married to Leah Busby at time of enlistment. Private Wilford Albert Buttle – 211 Battalion. 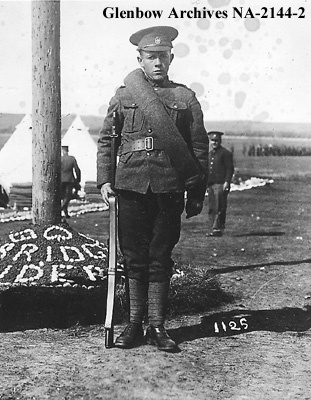 Private Rupert Edison Burr – 1st Depot Battalion, Alberta Regiment. Trooper Frank Daw – Killed in action April 1, 1918, served with the Fort Garry Horse (cavalryman) the records say that “Son of Francis Daw, of Hillside Farm, Gleichen, Alberta; husband of Annie Maria Daw. Next of Kin: Frank Daw” He is listed on the Canadian virtual war memorial here. He is buried at Vimy France. Private Fred Day – 211 Battalion. Private Thomas William Davidson – His enlistedment papers say he has a mother in England, that he is divorced and 26 years old and his profession is paper hanger and decorator. He enlisted in the 211 Battalion. Sergeant Paul DeConinck – Immigrated to Gleichen prior to WW1 from Belgium; went back to fight with the Belgium forces. Private David Fred Fraser – Listed as married when he enlisted in the 211 Battalion. Private Mike Foxhead – 50th Battalion, Died October 23rd, 1917 and is buried at Ypres; he was from the Siksika Nation. Private Theophilus Paul Gillmore – 211 Battalion. Captain George Hamilton Gooderham – 156th Brigade, was living in Toronto at time he enlisted and his father and brother lived in Gleichen. Private Roderick Malcolm Gooderham – Brother of George Gooderham, 31st Battalion. Killed in action during the Somme Offensive in the attack on Courcelette September 27, 1916. He is buried in France. Private Alfred Guay – 1st Depot Battalion, Alberta Regiment. Private Herbert James Harrison – 211 Battalion. He worked in the Gleichen bank prior to enlisting. Lieutenant Thomas Hill Irvine – Royal North West Mounted Police – daughter/next of kin is listed as Olga Patricia Irvine of Gleichen. Private Horace Clarence Inkster – 211 Battalion. Private Reginald Nathan Jowett – 2nd Canadian Mounted Rifles Battalion, killed in action October 30, 1917. This was part of the Passchendaele offensive. Private Oscar Maillroitt – 211 Battalion. 2nd Lt. William Brown MacDuff died on December 2nd, 1917. He was from Scotland and had come to Canada to work for the Canadian Bank of Commerce. He enlisted with the 56th Battalion and served in England before transferring to the Royal Highlanders. The virtual war memorial has a photo of him and according to the records he worked in our bank from August 1st 1912 till he enlisted on June 18th 1915. Private Samuel McLennan – 211 Battalion. Private Martin Charles McCarthy – 211 Battalion. Lance Corporal Charles Eavers Marshall – 10th Battalion. Killed in action on April 14, 1916. Private Elwood Miller – 1st Depot Battalion, Alberta Regiment. Private August Olson – 211 Battalion. Private Alfred Parker – No. 8 Field Ambulance – his wife Nellie Jane Parker is listed as next of kin, at the time of his enlistment his profession was listed as butcher. Private Eugene Howard Patterson – 1st Depot Battalion, Alberta Regiment. Lance Corporal Ralph Wakefield Prestwich – 211 Battalion; he was only 16 years old when he enlisted. Private Arthur Roberts – 15th Battalion, killed in action September 26, 1916. He left behind his wife Rose Roberts later remarried as Rose Riches. Private David Gerald Roberts – 211 Battalion. Sergeant Oscar Samson – (from Cluny) Canadian Railway Troops. Private George Talmage Scott – Oldest of the 4 Scott brothers, drafted into the 1st Depot Battalion, Alberta Regiment. Corporal Frank Scott – He is listed as an engineer prior to enlisting in the 211 Battalion. Lance Corporal Edmond Scott – Younger brother of Frank Scott and older brother of Victor (they all listed the same father on their forms). He was a tinsmith prior to enlisting in the 211 Battalion . Sergeant Victor Lawrence Scott – Younger brother of Frank and Edmond; profession was listed as ranch hand; also enlisted in the 211 Battalion. Gunner James Service – 78th Depot Battery, brother of William John and son of William and Agnes. Private William Service – Was married at time of enlistment to Agnes Service; he was the town Blacksmith and enlisted in the 211 Battalion. He was 45 when he enlisted. Private William John Service – Son of William and Agnes Service, he was 24 when he enlisted. His dad enlisted into the same unit a week later. Private Leonard Thomas Shaver – 211 Battalion. Private William Stacker – 211 Battalion. Private Carl Stumpf – 211 Battalion. Private Adolph Vollmin – 4th Battalion, Killed in action on October 1, 1918. Buried at the Sancourt British Cemetery in France. Captain E.F. Ward – Son of Colonel Ward; he fought with the 3rd Battalion of the Kings Royal Rifle (Britsh) he served in the South African War and the siege of Ladysmiththen retired from active duty in 1907 and purchased a farm 2 miles outside Gleichen. In 1915 he returned to England and active service with the 3rd. Private Charles Cuthbert Walker – Enlisted in the 211th Battalion. Private Alexander Watson – 211 Battalion. Private William Weeks – Married to Flora Weeks at time of enlistment in the 221th Battalion. Private Frank Robert Wernett – 211 Battalion. Private Emil Weltner – He enlisted in the 211 Battalion and listed as a next of kin his wife who was still in Switzerland. Henry Wingfield – 218th Battalion – not from Gleichen but came from Edmonton to Gleichen to enlist. He was the unit bugler. My great grandfather was alfred parker, i am the granddaughter of his son raymond henry parker. very happy to have found my great grandparents in canada as none of the family have any idea about it. Glad to help. He was the town butcher prior to enlisting. My grandfather was Thomas Bates. I just visited the Menin Gate, in Ypres, Belgium, and was fortunate to have been witness to a very moving evening ceremony. My surname is Jowett (of Winnipeg, MB), and I note that Reginald Jowett is noted on the Menin Gate Memorial, who died in the Passchendaele offensive, and was from Gleichen. I now live in Calgary, AB, and would be interested to know if any surviving members of the family of Reginald remain.